This isn’t a photograph, but it is the closest thing I have to one as far my great-great-grandfather Markus Hoffer is concerned. His looks can be inferred, a little bit, from the physical description given in his military service record and that is the best I have for now, until the magical day when a cousin I don’t know yet sends me a cabinet card portrait of our mutual relation. I am not very good at visualizing things based on lists of characteristics, and so this imprecise word portrait of Markus does not really help me too much. Of middling stature, Markus had brown hair and eyes, blond eyebrows, a pointy (spitzig) nose and an oval chin and face. His mouth was “gewöhnlich,” or ordinary, which I like because it is so very unhelpful as far as descriptions go, and his one distinguishing characteristic is given as pockmarks (blatternarbe). He spoke only German and stood 61 inches, which means he was roughly 5 feet tall. I imagine him looking a little bit like his descendants, but shorter, with a pointier nose and pockmarks, which is maybe not accurate, but it is the best my imagination can do with this description. Markus was born in Senica, Slovakia in the summer of 1839 to Friedrich Hoffer and Anna Fleischmann, the youngest of their four children who lived to adulthood. There were at least two other sons born near Markus in the birth order who died as children. Perhaps the smallpox that left Markus with a pitted face was what killed these brothers, but I have not yet found records of their deaths, so anything is possible. Beginning in 1838 or so, Friedrich and Anna had non-permanent residences in Vienna as well, evidenced by the births of sons Emanuel and Max (the two boys who did not grow up) in that city. 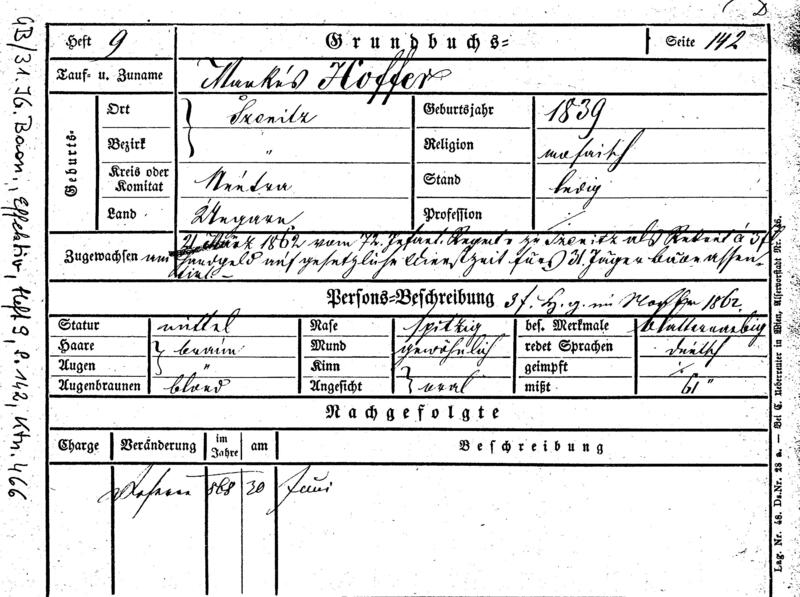 According to his application for naturalization as a citizen of Klosterneuburg, Austria in 1886, Markus indicates that he has lived in Klosterneuburg since 1851, which meshes with a story about his family’s resettlement there. It’s a good story and one that I am not yet ready to tell, but to give a summary: Markus’ probable grandfather Meyer Fleischmann returned some stolen candlesticks to the Klosterneuburg monastery, having bought them from the thief in his travels as a junk trader. In return for his honesty, Meyer and his family were allowed to settle in Klosterneuburg and so became the first Jews allowed to live there since the middle ages. Klosterneuburg is not far from Senica, and because he was still a registered citizen of that city, Markus returned there to fulfill his military obligations, as army service was compulsory throughout the Austro-Hungarian Empire in this era. Records of such service are often difficult to retrieve for the majority of regular soldiers unless you know the name of their regiment and their dates of service, things that I was lucky enough to learn from Markus’ extraordinary 1886 citizenship application. Because of this document, I knew that he had served in “Jägerbataillon Nr. 31.” during the 1860s, and the Austrian Kriegsarchiv was therefore able to send me the record pictured above. After his 1868 discharge from the army, Markus returned to Klosterneuburg and in 1869 married Katharina Fischer in the Fünfhaus Synagogue in Vienna. His occupation is listed variously as hausierer (peddler), krämer (grocer), trodler (second-hand merchant) and handelsmann (merchant) on various documents. His citizenship application also mentions possession of a “landbrewery” certificate and a shoeware trade license. Following in the footsteps of his honest grandfather Meyer, Markus notes that he has “never had a fine or other judgment against me.” He and Katharina had 5 children, 3 of whom lived to adulthood, including my great-grandfather Emil. In the 1890’s it appears that the family moved to Vienna, where Markus died in April 1909 of intestinal cancer. My grandfather, Franz, was born 4 months later and was given the middle name Markus.